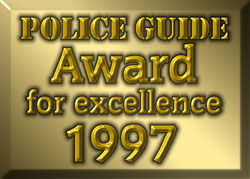 "Site of the Week" Award for 12/29/96 - 1/4/97! "I honor and support all law enforcement officers. Thank you for all you give to us and the sacrifices you make for us every single day! It is my pleasure to award your site.